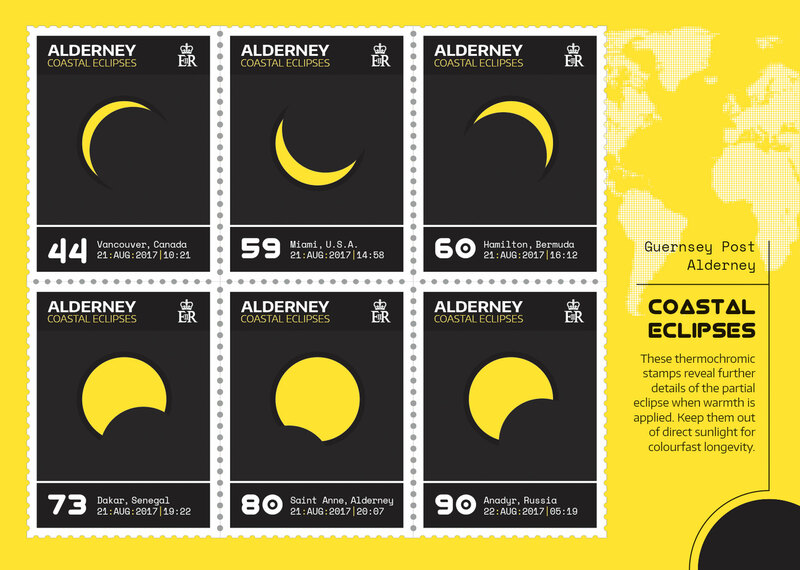 Guernsey Post is delighted to announce that it will release a set of heat sensitive stamps in celebration of one of nature’s most impressive sights: the first total solar eclipse visible from the continental United States in almost four decades. To mark this spectacular event on 21 August 2017, which can be witnessed by anyone within the path of totality, Guernsey Post has depicted six coastal locations that will be treated to a partial eclipse, which can be seen by millions of observers outside of the path, including Alderney in the Channel Islands, Canada and Russia. Created using heat sensitive ink, the stamps reveal full eclipses, as well as the altitude and direction of the eclipse for each location upon coming into contact with warm hands. A relatively thin ribbon around 70 miles wide, the eclipse’s path will cross the U.S. from West to East. The first point of contact will be at Lincoln Beach, Oregon at 09:05 Pacific Daylight Time (PDT). It will cross through Oregon, Idaho, Wyoming, Montana, Nebraska, Iowa, Kansas, Missouri, Illinois, Kentucky, Tennessee, Georgia, and North and South Carolina. The total eclipse will end near Charleston, South Carolina at 2:48 p.m. Eastern Daylight Time (EDT). A total eclipse is a natural phenomenon that occurs when the Moon passes between the Sun and Earth and blocks all or part of the Sun for up to about three hours, from beginning to end, as viewed from a given location. For this total eclipse, the longest period when the Moon completely blocks the Sun from any given location along the path will be approximately two minutes and 40 seconds. The stamps, which will be issued on 19 July 2017, are available to pre-order from 28 June 2017 at www.guernseystamps.com or by calling Philatelic Customer Services on +44 (0) 1481 716486.